Sunny’s Entertaining: Happy Memorial Day! Hoping everyone enjoyed the celebrations and observances of all those who have given the ultimate sacrifice for our country. A special day like this calls for a special treat-one that reminds us just how fortunate we are to enjoy life’s simple pleasures and to never take it for granted. 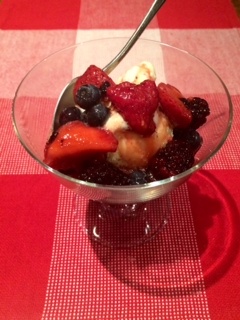 Here is a recipe my family enjoys for a sweet ending to the day-and it’s got the patriotic Red, White and Blue! Serve over vanilla ice cream!